The final moments of qualifying at Sepang were thrilling. Not only did Dani Pedrosa, in that terrific new form that we have seen since Aragon earlier this year, blaze his way through to take pole position at the track, he did it so convincingly that he managed to shatter the lap record too. Pedrosa set a time of 1min 59.053sec, four-tenths quicker than his team-mate Marc Marquez. 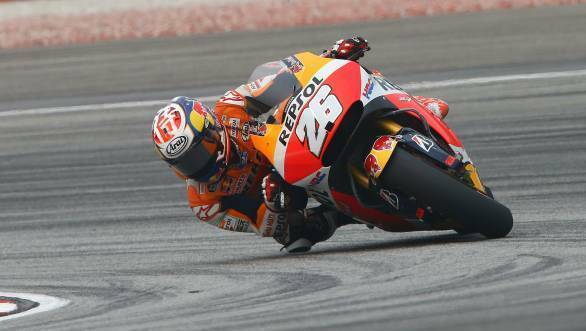 Dani Pedrosa shattered the lap record at Sepang and took pole too! Then, there was Valentino Rossi who pulled something out of the bag in the last few seconds of qualifying, managing to take a spot on the front row of the grid with a timing that was third quickest. This caused his team-mate and championship rival Jorge Lorenzo some amount of embarrassment, given that the Spaniard thought that he had taken third spot on the grid, only realising that this wasn't the case when he was denied entry to Parc Ferme at the end of Q2. Which means on row two of the grid, are Lorenzo, Cal Crutchlow and Andrea Iannone. But Sepang, other than the fact that it is the penultimate race of the season, is turning out to be quite the potboiler. There have been accusations being flung around, allegations being made, and then some. It started when Valentino Rossi, accused Marquez of supporting Lorenzo and aiding him at Phillip Island. While Marquez denied any such thing, claiming that he had focussed on his own race, there appeared to be some amount of help going Lorenzo's way at Sepang. Marquez allowed Lorenzo to follow him on his first attempt at Q2, allowing Lorenzo to slot in behind him on the timing sheets. Whether or not we will see any aiding and abetting during the race itself, remains to be seen. What we can tell you, though, is that Sepang is sure to be a thriller!